Among intrinsic back muscles the erector spinae remains the largest group. The muscles are located medially amid the spinous processes, posterolaterally towards the vertebral column as well as laterally towards the angles of the ribs. 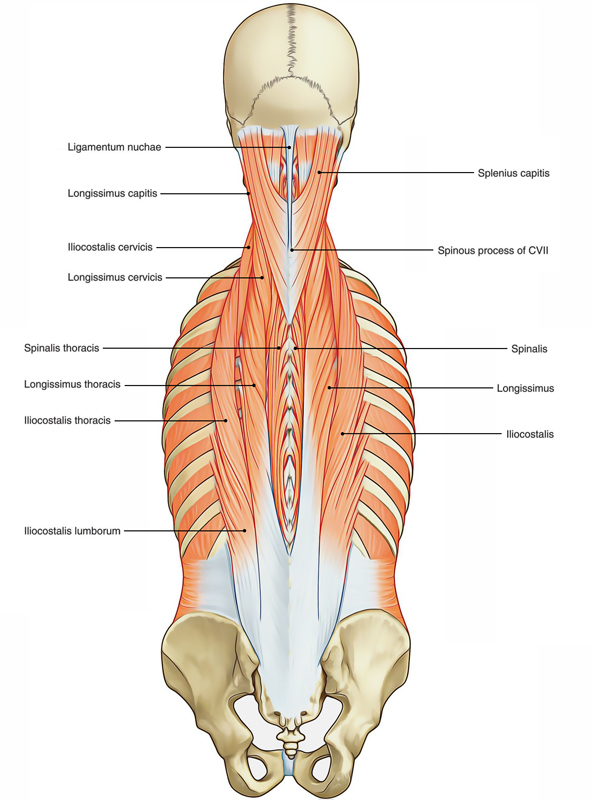 Inside the thoracic and lumbar regions thoracolumbar fascia as well as the serratus posterior inferior, the rhomboid and splenius muscles surround them. It originates and inserts in semispinalis capitis. The iliocostalis is the outer or most laterally located column of the erector spinae muscles, which is related to the costal elements and travels from the common tendon of origin towards multiple attachments inside the angles of the ribs as well as the transverse processes of the lower cervical vertebrae. The longissimus is the middle or intermediate column, which outspreading from the common tendon of origin towards the base of the skull, is the biggest of the erector spinae subdivision. In this huge region, the longissimus muscle has the lateral location in the area of the transverse processes of the several vertebrae. The spinalis is the most medial muscle column and interlinks the spinous processes of neighboring vertebrae and is said to be the smallest among the subdivisions. Most constant in the thoracic region. Generally absent in the cervical region. It is associated with a deeper muscle a.k.a. the semispinalis capitis as the erector spinae group approaches the skull. The main extensors of the vertebral column as well as head are the muscles in the erector spinae group. They straighten the back, returning it towards the upright position from a flexed position, as well as draw the head posteriorly when they act together. Via contracting and relaxing in a synchronized way, they contribute in directing vertebral column flexion. They laterally turn the vertebral column when they act together. Individual contractions of muscles attached to the head turn the head towards the dynamically constricting side.